Made to look like distressed leather, this Bible cover features exterior pockets, a debossed cross, decorative stitching and interior pen and pencils holders. This cover will fit the Quest Study Bible, the Zondervan NIV Study Bible and The Student Bible as well as many more books and Bibles up to 6 7/8- x 9 5/8- (224 x 175 mm). 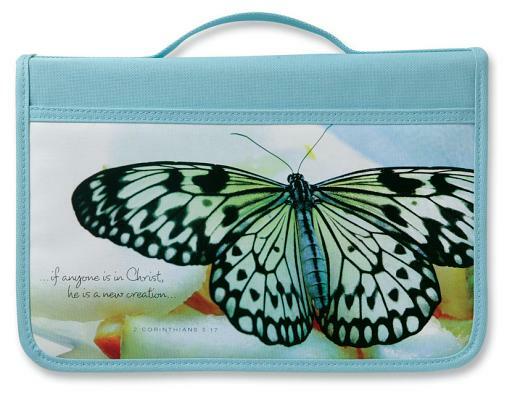 Featuring metal accents, purse-style handles and removable key-chain, this is a practical and fashionable Bible cover. This book and Bible cover will fit the Zondervan NIV Study Bible, Aspire: The New Women of Color Study Bible, the NIV Women of Faith Study Bible as well as many other books and Bibles up to 6 5/8" x 9 1/2" (241mm x 168mm). The great American wildlife artist John James Audubon created images of North American birds that have seldom been surpassed in beauty and aesthetic quality. Here are twelve of the best-known of his illustrations, including the black-and-white warbler, brown creeper, Carolina wren, mangrove cuckoo, clay-colored sparrow, northern oriole, and six more. Each illustration is printed in full color on one side of a sturdy bookmark (identifications on back) -- perfect companions for your reading pleasure. The elegant bookmarks in this collection reflect the distinctive aesthetics of Celtic design, especially the rich coloration and sinuous intertwining of geometric figures and organic forms. The designs, rendered here by noted illustrator Co Spinhoven, are reminiscent of medieval manuscript illumination and will add a touch of Celtic enchantment to any reading experience. Full-color portraits of 12 favorite animals from around the world -- camel, giraffe, tiger, lion, rhinoceros, crocodile, gorilla, monkey, elephant, polar bear, panda, and zebra. Perfect companions for all kinds of reading adventures. Add extra pleasure to reading with beautiful full-color bookmarks recalling characters from "Beauty and the Beast, Cinderella, The Little Mermaid, Sleeping Beauty, and "8 more. The fragile radiance of butterflies and the delicate beauty of flowers lend an exceptionally attractive touch to these twelve practical place-keepers. Adapted from rare Victorian-era chromolithographs, each design features a colony of gloriously colored butterflies surrounded by charming floral accents. A lovely way to find your page in any book, these sturdy, laminated bookmarks are perforated for easy removal. Cuddly creatures -- all ready to steal somebody's heart as petite place keepers -- appear in a sailor suit, as a circus clown, in a ballerina's outfit, and more. Dynamic, boldly colored markers -- adapted from authentic African artifacts --depict human and animal figures, abstract designs, domestic accessories, much more. Handsome bookmarks with authentic designs from Kiowa, Navajo, and other tribes feature rich symbolism and dramatic imagery. Twelve brightly colored place-keepers feature endearing drawings of jolly kitties at play in swimsuits, pajamas, pinafores. These enchanting images are ideal for marking your place in any book. Twelve captivating bookmarks depict a host of ethereal fairyland creatures in repose against colorful garden backdrops -- seated on a leafy perch beneath lovely blossoms, climbing an ivy vine, and in other floral settings. Printed on sturdy stock and laminated for durability, these easily detachable, ready-to-use place keepers, presented in a handy book format, will stay clean and wrinkle-free until ready for use. Dazzling full-color place keepers depict shellfish, a sea horse, lobster, starfish, and other marine animals posed against a lush backdrop of undersea vegetation. Twelve festive bookmarks depict Clara and her brother Fritz standing before a sparkling Christmas tree, the mysterious Godfather Drosselmeyer, the Nutcracker Prince in a duel with the Mouse King, the Sugar Plum Fairy, and other delightful characters. Perfect placekeepers for holiday reading, these colorful illustrations from the popular Yuletide tale will delight young readers the year round. Young performers en pointe, bowing to an audience, in an engaging pas de deux, and more -- on placekeepers attractively framed by floral bouquets and other appealing borders. A dozen glorious designs, based on the stylish, nature-inspired stained glass creations of Louis Comfort Tiffany. Forty-five different species of dazzling winged beauties enhance these practical placekeepers, among them the Lysandra coridon, Phoebus rurina, Colotis danae, Hypoleria oreas, and Anartia amathea. Identifications.